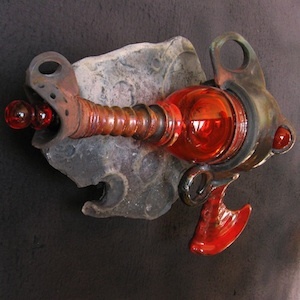 To purchase a raku ray gun sculpture or to see all those currently available, please click here to visit our Rakumancy store on Etsy.com. 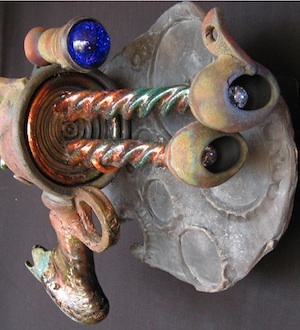 Raku Ray Guns are one-of-a-kind ceramic sculptures made by West Magoon. 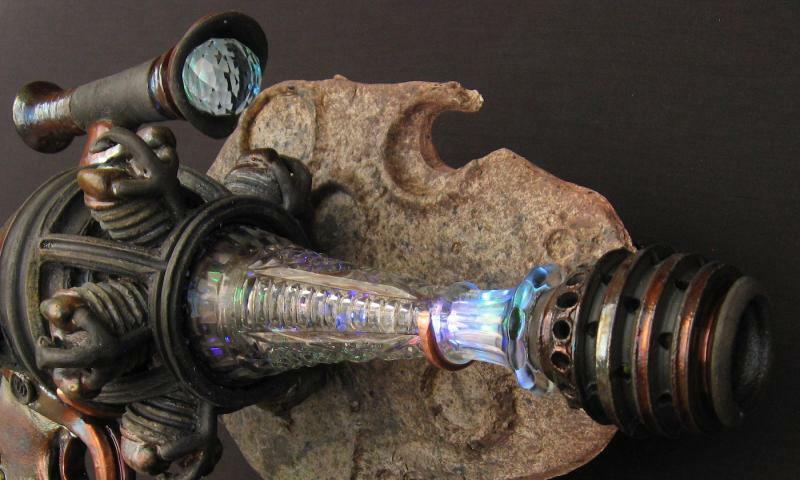 They are inspired by alien technology unearthed at a secret UFO crash site, known only to a tribe of Wyoming Hill People. 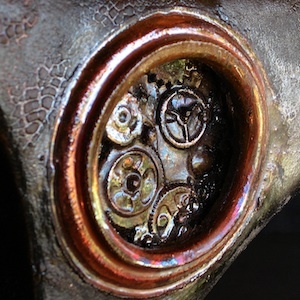 One source (Tinkergirl at Brassgoggles), proclaims that these sculptures are soundly stationed in the pulp end of the Steampunk spectrum. 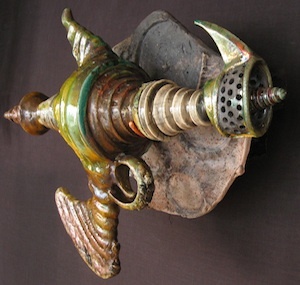 To see a gallery of all the Raku Ray Guns that have been made and sold in the past, please go to the list at the left of this page and click on Archive of Sold Raku Ray Guns and also Archive of Sold Raku Ray Guns Two. 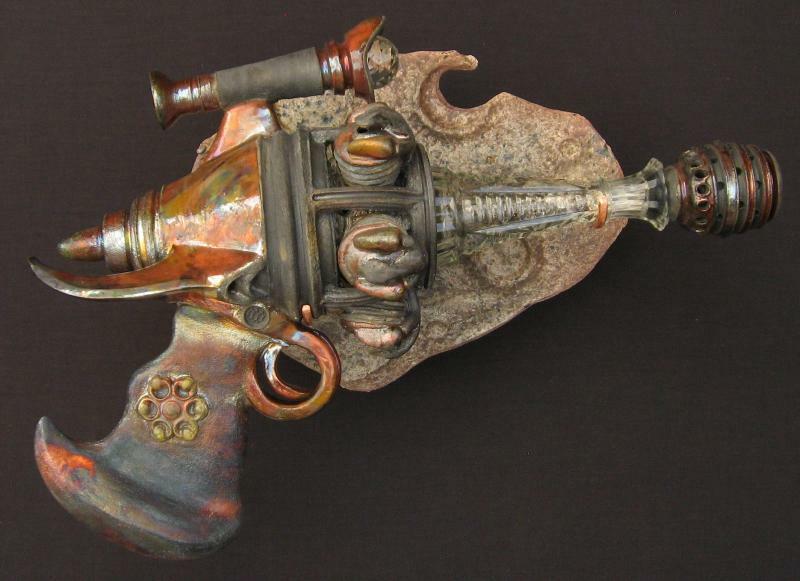 Each ray gun is named after a classic science fiction author, character or device. The moon crater wall plaques that support the ray guns each measure 12" long by 9" high (or 12" high, 9" wide when used vertically) for the regular size and 15 1/2" long and 10" high for the rifle-style ray guns. 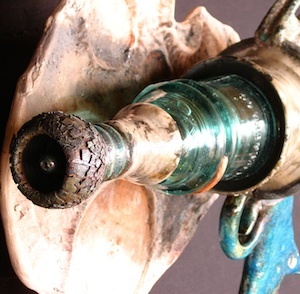 Thumb, of Fist of Blog says the Raku Ray Guns "are the bee's knees!"